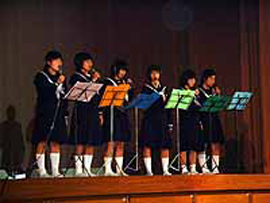 Photo from Hishikai Junior High School. Another annual event on the Japanese school calendar is the cultural festival. The student-led cultural festival presents an opportunity for classes and clubs to perform and to celebrate outside the classroom. The cultural festival is open to family, friends, and community members. For junior high schools, the cultural festival features award presentations, performances by students and teachers, and the display of student work, including artwork. Some teachers put on plays for their students; this gives the students a chance to laugh at their teachers when they behave very differently than they do in class. In high school and college, the cultural festival takes on even more importance, with students creating booths and shops that they run with their class, club, or circle. Some university cultural festivals are very well known. They may feature performances by nationally-known performers, as well as performances by students themselves. Students from other universities also attend these festivals. The cultural festival at both the high school and university level is sometimes used as a recruiting tool for prospective students. Cultural festivals are held at various times, depending on the school, but are usually held around Cultural Day, which is November 3.